A Portland artisan busily fills orders for her gilded reptiles after magazines discover them. Brooke Hoerner says she has a problem: She can’t stop herself from making things. Like the time she decided to make something for a former boyfriend who loves dinosaurs. She ended up fashioning him a gold-colored planter made from a dollar store dinosaur. Now she can’t stop making the silly things. That’s because people all over the country like them, really like them. And they are willing to pay $15 apiece for them, $27 for a pair. Hoerner has gotten orders for about 1,400 of the little curiosities since Real Simple magazine picked the planters to be one of its “29 Great Gifts for Women” this holiday season. Down East magazine discovered Hoerner’s metallic gold dinosaur planters this year as well, and spotlighted them in its gift guide. 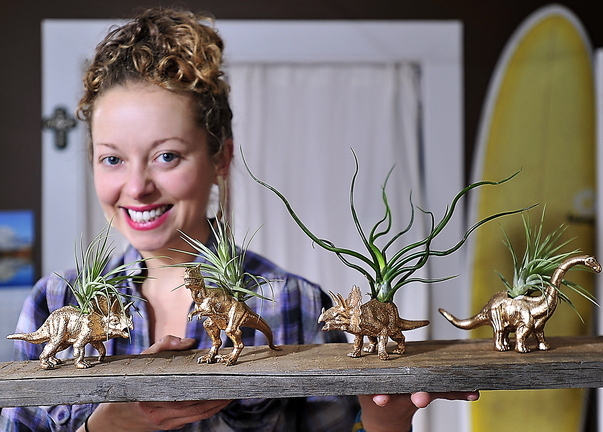 So Hoerner, 31, spent September making some 700 dinosaur planters in her downtown Portland apartment. She still has several hundred more planters to make before Christmas, with new orders coming in every day. Call it a Christmas dollar store miracle, or proof that everyone loves dinosaurs more than they might admit. But after years of working at restaurants and trying hard to sell her handmade jewelry, Hoerner is busier than Santa’s elves trying to keep up with the growing national demand for a clever, fun trinket she never expected to sell. “I have this problem, where I just have to make things,” said Hoerner, a Colorado native who moved to Maine about three years ago. Hoerner makes jewelry out of stones and seashells and other things under the company name Alyce Paul Curiosities, named for her grandmother. So after making a few dinosaur planters for her boyfriend, she decided to put them up for sale on Etsy.com, an e-commerce site focusing on handmade goods. “I would check Etsy for my jewelry and never sell anything. Then one day I got a message that I had finally sold something, and it was the dinosaurs,” said Hoerner. Then in July the folks from the lifestyle magazine and website Real Simple saw an online picture of her planters and were instantly intrigued. Hoerner is making all these dinosaur planters while waiting tables one day a week and working for a ceramic artist three days each week. On a recent Wednesday, Hoerner was using Krylon cans to spray-paint a half-dozen or so plastic dinosaurs, which she then skewered on a metal rod so they would dry faster. Her work table was filled with tiny plastic dinosaurs waiting to be converted to planters, including a stegosaurus, an apatosaurus and a dilophosaurus. Under her table were a dozen or more planter orders (there are usually two per order) in boxes waiting to be shipped out. Over the table, attached to the ceiling, was a net holding dozens of tillandsias plants, known as air plants, that Hoerner buys from a supplier and inserts in her planters. They don’t require soil, so they are perfect for stuffing in a tiny plastic dinosaur. Plus, they have a spiky appearance that seems to fit the dinosaur aesthetic perfectly. Hoerner begins her planter-making sessions by scouring local dollar stores for dinosaurs, sometimes buying hundreds and cleaning the store out. Back in her apartment she drills a hole in the dinosaur’s back, smooths out the edges of the hole with an knife, sprays them with paint and a finish, and then fills them with a plant. Then she packs and ships them. In the future, Hoerner would love to make the dinosaurs herself, maybe ceramic ones, since she always prefers to make something rather than buy it. For now, she’s psyched her planters have caught on and will keep making them with ready-made dinosaurs, since folks like what she’s doing. “When Real Simple told me I had to guarantee I could fill 350 orders, I was a little overwhelmed but thought, ‘What have I got to lose?’ and decided to just go for it,” said Hoerner. Because some people wait and hope for some good fortune, while others make their own – out of dollar store toys and Krylon paint.